This entry was posted in Family Recipes, Salads (Insalati), Vegetarian and tagged Dandelions, family recipes, Food, Italian, Recipes, Salads by ChgoJohn. Bookmark the permalink. I’m glad you enjoyed it and thank you for taking the time to comment. The interesting thing about it, as far as I remember, is that children won’t touch the dandelion for fear of wetting the bed – eating it didn;t come into the equation! What a lovely childhood memory and very well told-I could almost picture the scene! Thank you! Those memories are pretty much hard-wired into our minds. Sis & I laugh about them now but, at the time, we were so embarrassed. I’m glad you enjoyed the post. Oh John, before I´d even read your post this bought a torrent of memories rushing back for me. I love the story, and can imagine you and your sister cringing in the back seat of the car! We too used to eat Dandelions and my godmother then went a step further and turned half her garden (next door to ours, we had taken the fence down between the two gardens for easier access and more space for the two families) into an area for growing cicoria. It was all netted off (from birds and children) and you can imagine how we kids (my brother and her 2 daughters) felt about this, I remember one day we were all in serious trouble when we decided to make “caffé” by using an old coffee pot we had been given to play with and filling it with earth mixed with water to make coffee. Being the little gourmets we were the best, softest earth for our coffee was where the cicoria was planted…well, I am sure you can imagine my godmother´s reaction to find we had been digging up her precious salad! We´re so lucky aren´t we to have these wonderful memories! Yes we are, Tanya, and even luckier to find others who share similar experiences. I’ve said it before: this blogging “thing” is rewarding in ways I never dreamt possible. I can see your dad pulling up to the side of the road and you and sis dying with embarrassment even before he has stopped the car. I think it is a parents duty to embarrass us when we are young – well so it seems. Well, my Dad certainly took that “duty” seriously! At the time. Sis & I thought him totally oblivious to how he was ruining our lives. Now we realize how just wrong we were and laugh about it. Good luck harvesting! I love the fleetingly available vegetables of spring. Haven’t had a dandelion salad for years! Now to the daunting task of finding a dogless site around here. Thanks, John. This was the first dandelion salad I’d made in a couple years but I’ve promised Zia that I’d pick some when I visit her next time. I went along the lakefront, Gail, for my cicoria. The grass was barely grown so I could easily see if the area had been “spoiled.” This year, with the warm weather, dandelion season came early. Who knew? A wonderful story!! It’s funny that no matter what our parents did there was a certain age when we became aware that it was “embarassing”. You made me laugh John and thank you. And yes to a simple salad of dandelion leaves, dressed so simply. You’re very welcome, Eva, and, yes, you have to be careful where you pick. We’re fortunate here and there are plenty of “safe” places to go picking. Our entire lakefront, all 28 miles, is parkland and there are numerous forest preserves, none of which are ever fertilized or treated chemically. Even so, I only go when the grass is just turning green so that I can get a good look around before I start picking. Dad taught me well. Agreed, your lake front is incredible…Mayor Daly came up to Toronto a few years ago to advise on how Toronto can transform it’s horrible lake shore into something like yours! Did you know that Frank Gehry is Canadian? He designed the 925-foot-long winding bridge connecting Millennium Park to Daley Bicentennial Plaza. Cool eh? Not to make light of the suffering it caused, The Fire did this city a favor, allowing for a rare, relatively modern “do over”. I didn’t know Gehry was a Canadian. Yes, it is cool I need to send pics of it to the folks up in Winnipeg. The Bean is one of those public art projects that, at first, you wonder what kind of monstrosity are they proposing. You watch it being built and still it leaves you wondering. Then, once completed, you get to see it and you wonder why it wasn’t erected earlier. I, too, love it and really enjoy watching people walk up and “discover” it. 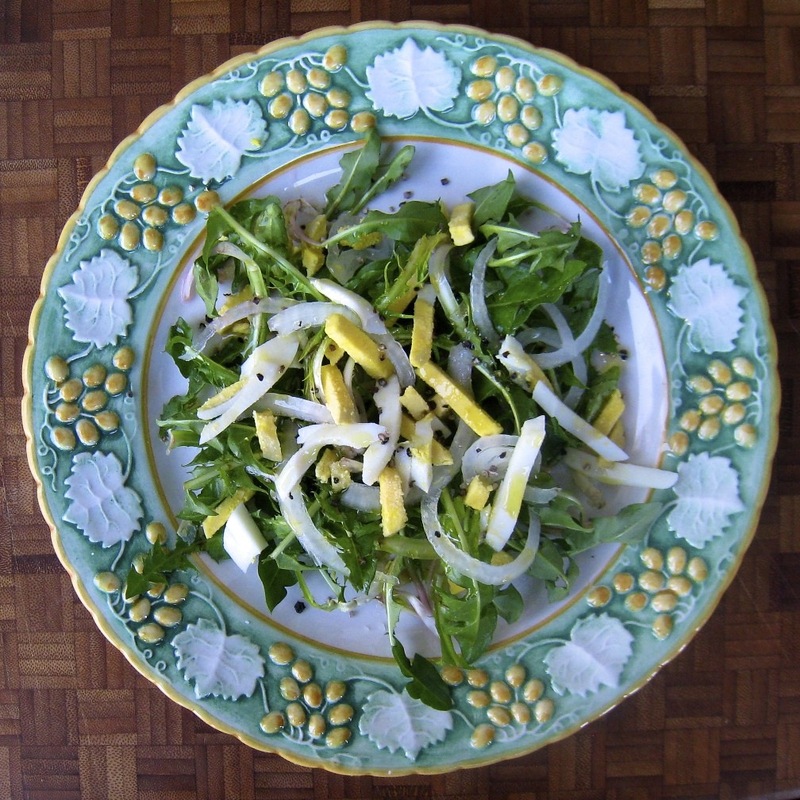 Can’t convince Hubby to eat the dandelions or chickweed out of the yard, but the arugula – a weed in its native places – is his favorite! As always the memories are precious. I pulled some dandelions out at the forest preserve, a little rendered bacon fat (of course!) and vinegar and it was a really nice wilted greens salad. Before moving to the Northern Hemisphere I did not even know if the existance of dandilions, let alone know that you could eat them! I imagine that, as with any plant, the younger the greens are the tastier they are. When we move to an area where I am sure they are not fertilised by dog, I think I will give it a try. Thank you, Colline. Yes, the younger plants aren’t nearly as bitter as the larger, older ones. Finding a “clean” area is, of course critical. Here, we worry about dogs and chemicals. In rural Michigan, it’s deer that are the concern. That’s why going in early Spring is so advantageous. The plants are young and tender and the grass hasn’t yet grown enough to obscure the landscape. I hope you do give them a try one day. I don’t think you’ll be disappointed. I’m not familiar with “robast/rabast” but I will ask Zia about it the next time we chat. I don’t know how that got past Dad’s radar. Another chance to embarrass us AND have fresh greens? There has to be a reason that I just don’t know about. Great story, put a smile on my face. I too would be hiding in the back of the car! Sounds like you had a great dad loving dad with a sense of humor! Great looking salad, great tips too on picking them while young and away from “doggy traffic!” (made me lol) Have a great day! I hope you blog about your “weed” salad, Celi, especially since your “weeds” are cultivated. Your salad is a far cry from our simple one and sounds delicious. I’m sure that Zia will be very interested to read your recipe. And yeah, I wondered whether you guys got any frost last night. We were lucky, here in the city, that temps didn’t get quite cold enough for frost. Still, I bet this will be the last of it for the season. Fingers crossed. My mother tells of picking dandelions in the spring in Illinois, with my Grandmother’s strict instructions to pick only the tiniest and tenderest. She never made us pick or eat them here in California. I’m so glad, Barb, that you enjoyed today’s post and thank you for leaving such a kind comment. It’s a wonder my Sis & I survived such abuse! 🙂 And if a child doesn’t have at least 5 similar stories of being completely embarrassed by a parent, that parent didn’t do her/his job. Glad to hear you did yours! Your story reminded me of the “fun” we had on the farm early in the planting season–me with the bag of corn, my sister with the hoe. After the 5th or 15th row, we were less enthused and by the time we were over the age of 9 or 10 we knew the consequences of canning those rows would produce mid-summer when our friends were busy splashing in a pool or shopping. Foraging and farming is work, but makes for great memories and stories now, much like your dandelion memories with your sister. Great story. Thanks, Chris. Next Spring, you can join me and we’ll pick enough for the 2 of us. I’m surprised to learn just how rampant this dandelion picking form of child abuse was during our youth! At the time, we thought we were the only kids on the planet forced to “work the fields.” How funny! I’ve never eaten cooked dandelions but have often thought of giving them a try. Bitter greens were a mainstay at our dinner table, so, I don’t think I’d find them objectionable. I think the hardest part would be getting used to the idea of cooking them and not putting them in a salad. If you guys make dandelion wine, I hope you blog about the process. I, for one, would be very interested. Boy John…I wish you had posted this a few weeks ago. We received some dandelion greens in our CSA and I totally choked on their preparation. At least I have your wise guidance on file now for further use. cheers! I’m impressed that your CSA includes dandelions. Just a few days ago, I was looking into CSAs that serve Chicago. I’m canvasing friends to see if any use one or if they know of a good one. Until then, I’ll happily go to my farmer’s markets for everything but dandelions. Ya, we’re very fortunate with our CSA and I hope that we can find a decent one wherever we end up when we leave SLC in a few months. Leaving SLC? Sorry, Jed, did I miss something? Sounds like you’ve got a busy few months ahead, not to mention exciting, to boot! It is a busy few months ahead as Liz is finishing grad school and I’m in the middle of redesigning the website for a relaunch in early May. Exciting times! Thanks, Kay. The best thing about this salad, like asparagus, is that it’s only served in early Spring. Like the 1st robin you see, it means that Winter is officially over. I read the whole post and comments and am still smiling while writing this. Pictures of you and sis in the fields and hiding in the car keep popping into my head, such memories for you and your sis to treasure. 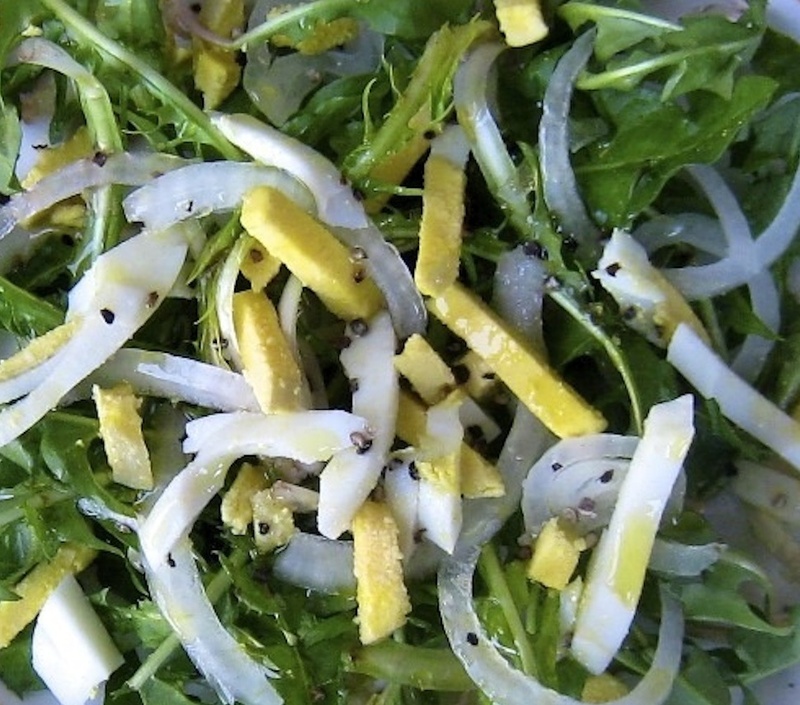 Bet if “Insalata della Cicoria” appeared at some high end restaurant (charging big bucks) people would order it, but call it “Dandelion Salad” and you could not give it away. Hah – your Dad got you both. 🙂 Love this story, and am actually ingtigued by using Dandelion greens. I pick so many out of our yard/garder, I could probably make a decent size salad. Hmmm. I want the salad AND the plate! They are both stunning. Okay so I’ve never tried dandelion greens, unless they were mixed and cooked in Horta when we were in Greece and I didn’t know it. Do they taste like arugula or what do they taste like..other than bitter if you get them too old? I had some dandelions just south of my little garden that I mowed over a couple of weeks ago, but am going to go back and check to see if they’ve risen again! What a great story about your dad, and I can just see him smiling while you and your sister hid. I’ll bet he was really a card, and such a great person to have as a dad. I love that you posted this! I was just thinking about dandelion greens, I just love them. Most people don’t eat them or know you can! Cheers! I lived reading this- what a great story! It is so funny to think of your dad relishing your utter embarrassment. It makes me smile to think of how I’ll be able to mortifying my kids when they get just a little bit older. This was all so vividly told, and I am dying to try dandelion greens now. To think that I’ve been feeding them to the chickens with other “weeds” I’ve pulled (many of which, I have recently learned, are not only edible but quite tasty too). Oh John! What a beautiful story… Thanks!! Thank you, Giovanna, and having visited Madrid, I know exactly what you mean. Your only options would be to grow your own or to go out into the country. No, I think your best bet would be to make a nice salad with some baby greens grown locally. They may not be dandelions but they will be just as tasty. Always love your family stories. I love that photo too, nice plating. Still need to try this! You poor kids! LOL! What a memory, I love it! Oh John, I can’t begin to describe how much I loved this post. I find myself excited about what you’re going to post next, and this post is a perfect example of why. Just amazing, and I feel better just reading about your memories. You are incredible, sir! Hubby and I were just talking about dandelion greens and how we could try them for the first time. Now we know! Thank you, Sarah, for leaving such an encouraging comment and for seeing that we were so mistreated! ((laughter)) The subject of dandelion picking never fails to give Sis and I a good laugh, especially when the freeway ramp is mentioned. Dad got us both good, real good! If you do give dandelion greens a try, please come back to tell me if you like them. The smaller the dandelion, the better. Good luck! Your photographs are stunning and in a wonderful light. The ceramic dish looks like Della Robbia. But the childhood memory, the hiding in the backseat, the shared history with your sister and the hindsight….ah, the hindsight as we sort through and make sense of what we experienced with out parents and grandparents, siblings, neighbors, friends and relatives. That is what you capture the best, John! Thank you, Ruth, for your generous comments. It’s been well over 40 years since Dad parked the car on that freeway ramp for the last time but I remember it as if it was yesterday. It was Dad as the practical joker that we would come to know better as we matured but, at the time, we were far too embarrassed to think of anything but ourselves. And today, Sis & I cannot help but laugh whenever the subject of dandelion picking is mentioned. That plate was worth missing the ferry boat. It is lovely. Thanks, Ruth. I’ve always felt that way, too. Such great memories with you dad, thanks for sharing John. Hey, who says it’s not acceptable to pick dandelions anymore!? 🙂 This salad sounds so fresh and delicious. I’m loving that plate you used for the salad as well–too pretty. Wonderful, the story and the salad. Your version of our wild asparagus! I see Roger’s already explained the French name for dandelions. I remember going to the market in Dieppe in northern France once and all the vegetable stalls had dandelions and very little else. We don’t have so many here in the south. Your Dad reminds me of mine who also loved to forage for free food wherever he went. Thank you. Dad was, indeed a forager. Dandelions, mushrooms and whatever else he could find. He told us that once, as a boy, he and a friend were climbing trees robbing bird nests of their eggs. He stuck his hand into an overhead nest and pulled out a snake that had bitten and held onto his thumb! He never got over his fear of snakes and would ask me to remove any that appeared around their house. What a fun story! It is a little enjoyable to make the kidlets cringe from time to time ….. I’ve certainly heard “Mum! You’re embarrassing us!” a few times over the years 😄 . I just may give the dandelion salad a try one of these days. I wouldn’t want to pick them unless I could be absolutely certain they hadn’t been sprayed, but they do sell the greens in the market I frequent (actually, it’s where I seem to spend all my disposable income!). I know what you mean about the spraying. I don’t care how fresh and nutritious the greens may be, if there’s the slightest chance that they’ve been sprayed with anything, I’m outta there. 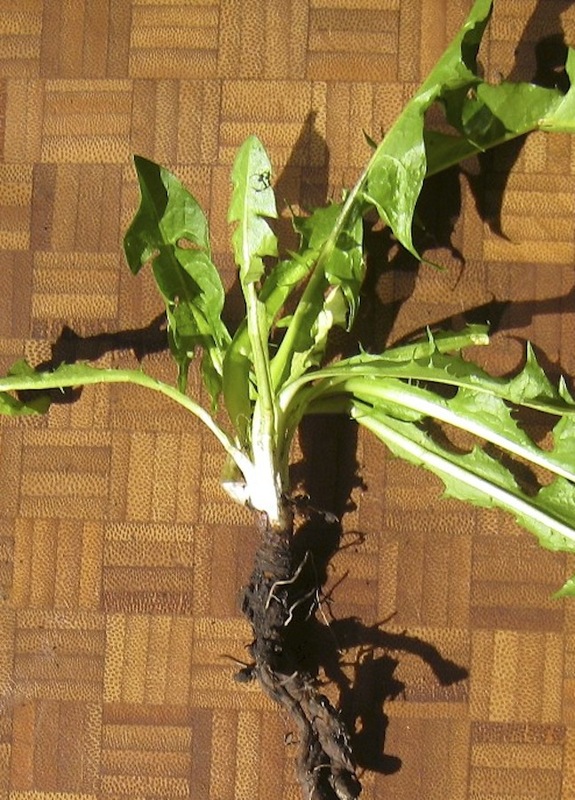 My markets carry dandelions year-round but the leaves are very large, about 18″. I believe they are too bitter to eat raw. If I could find some that are smaller, I’d definitely give them a try. Have never considered eating Dandelion greens before, but now I’d better. The salad looks so spring-y and fresh. Love the hard boiled egg slices. Nice photo John! I like to tell my teens, “Embarrassing you is just another free service I provide. You are welcome.” I figure we embarrass them whether we are doing something actually embarrassing or not, so we might as well go for the gold. Maybe your dad had the same theory. 😉 He really went for it apparently. Have a great weekend. Dandelions were like asparagus for us. Both meant Spring was here! If a parent doesn’t embarrass the kids, they aren’t doing their job. I think my Dad strived to see our eyes roll and cheeks blush. Gotta love him for that! A wonderful story, as always John. I can just see you and your sister horrified that your friends would see your father or far worse the two of you dandelion foraging. Thanks, Linda. I remembrer you’d mentioned dandelion picking a while back and hoped you would enjoy this post. Did you read Tanya’s comment? When she was a child, a fence was removed so that her neighboring Godmother’s garden could be attached to her family’s. Her Godmother’s garden was reserved for cicoria. Now that’s dedication! There simply was not enough room in our garden for cicoria. First and foremost, Grandpa was a tomato grower. Sure, he grew other things but the prime garden real estate went to his beloved pomodori. John, another completely engaging, heart-hugging story of growing up Bartolini! I think I love your Dad! And I think I’d love your salad. My association with dandelions (unfortunately I’d have to get past this) is making chains of the flowers as a girl, garlands for my hair, and then accidentally licking my fingers and getting that foul dandelion milk on my tongue. Does soaking the leaves alleviate that problem? Again, a wonderful post, as is your habit! And I love the photo of the finished salad in its bowl! John, this reminds me of my Mother and Aunt telling stories about picking the dandelions for a salad. I’ve never tried it myself. Thank you John for another heart warming story. Your dad really reminds me of my grandfather, he was a joker too and he had his own way of teaching a lesson or making a point. I have never had dandelions in a salad but will definetly keep an eye for it now. Thank you, Sawsan. Your Grandfather sounds like he was a wonderful man. John, I have just found your blog (thanks to Charlie at Hotly Spiced) and have just spent an enjoyable time looking through it. Regarding the dandelion and it diuretic abilities (though as a child I wouldn’t have known what that word meant) I also recall it being called here in Australia “pee the bed”. Maybe it’s a generational thing for people over 50. My lovely Italian greengrocer used to tell me about growing up in Italy when the family used to go out picking what we would have considered were ‘weeds’. I think I’ll go and see what is growing in the lawn. Charlie has quite a good blog, doesn’t she? She’s a talented writer and her family stories always leave me wanting more. I remember my Dad and maternal Grandfather, both of whom grew up on farms, talking about foraging for all kinds of greens and the like when they lived in Italy. It’s been far too many years for me to recall what it was they picked. I’m satisfied just picking dandelions. I’m not much of an daredevil when it comes to food. I’ll eat most things — if they’re known to be edible. I’m not about to be one that finds out. Hi John, I’ve just discovered your wonderful blog! I used to pick dandelions in the cemetery in the Bronx with my grandmother, Teresa, after visiting family graves. She’d pull out her pen knife and plastic baggie….most people can’t relate 😉 I describe myself as half Italian-American (maternal grandparents came over from Basilicata –grandpa first, then went back to marry grandma and bring her over) and half Italian (father from Rome). I have spent a lot of my life in Italy and am familiar with Le Marche–a beautiful region that not many tourists ever see. And I love Chicago. I’ve been in Madison for years, and need my big city fix every now and again. Welcome, Lisa! Ive been in Michigan visiting my Zia, the “star” of this blog and contributing editor. A brief synapsis of my family’s history in in the ROOTs page. I’m glad you found us! I’m surprised to see just how many people picked dandelions as children. At the time, we thought we were the only kids in the world that were force to endure such humiliation! Just this past Monday, I picked dandelions for our dinner that night. I never would have thought that possible when I was young! John, I saw this post and had to check it out! I too grew up with my grandmother whom always was looking to pick dandelions. It was one of her obsessions! We would pick them with her. She prepared so much with them. She didn’t drive, so we drove her everywhere. She was always ready for the dandelion picking. Your salad looks sensational and sounds so good right now with boiled eggs! I’ve not picked them myself in decades and I smiled the entire time I gathered them for this post. I must have been quite the sight for the passersby. That’s OK. I thoroughly enjoyed the salad. Dandelions make a dandy salad! A couple of days ago on our daily walk my wife and I walked past a house that had an abundance of dandelions. I was so tempted to go back and harvest some – and still am, truth be told. But who knows what chemicals that person used on their lawn? Although obviously not weed killer! Maybe I should just grown a bed of dandelions for our own use. Hmm, not that bad of an idea now that I think about it! Really great story and fun post – thank you. Every now and again, I randomly browse blogs that I follow and I am here on this post because I was discussing dandelions with a friend yesterday. I have lots of dandelions in my backyard (its dog less), but I just can’t get myself to eat dandelions salad. He posted dandelion salad two days ago and said “chose the young, tender ones too”, but I still haven’t gotten the courage to try. The story about your you and your sis hiding is hilarious! I enjoyed browsing…Kind regards!